A South African dung beetle at full gallop. South Australia’s equine lobby group Horse SA is promoting the use of dung beetles as a natural way of getting rid of horse manure from paddocks. 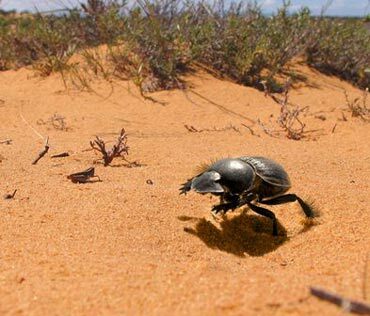 Horse SA has created a new website promoting the industrious beetles, saying they are “hard little workers that can save horse owners much time”. The new website provides information on promoting dung beetle health and land care through reducing the use of chemicals and adoption of sustainable land care principles. Dung beetles have many benefits including helping to control the infective stages of a horse’s gut worms and other pests such as dung-breeding flies. An active beetle population will also save horse owners time cleaning up after horses, with the added benefit of improving soil carbon and organic matter. Sustainable land care and dung beetles go hand-in-hand, say Horse SA. Dr. Bernard Doube of Dung Beetle Solutions Australia, worked with Horse SA to develop eight new “Horses, Bugs and Beetles” fact sheets that underpin the website information. Topics include de-worming, reducing chemical use and threats to dung beetles. A suite of educational PowerPoints based on the fact sheets can be downloaded from the website. The focus is on beetles active Southern Australia, however many of the key messages apply to horse owners world-wide.